Real estate firm Knight Frank is out with its annual Wealth Report, which is jam-packed with data on how the world's wealthiest people spend money on real estate. The report includes a section on the global cities that matter the most to high-net-worth individuals, defined as people with $30 million or more in net assets. It's based on four criteria: economic activity, political power, quality of life, and knowledge and influence. 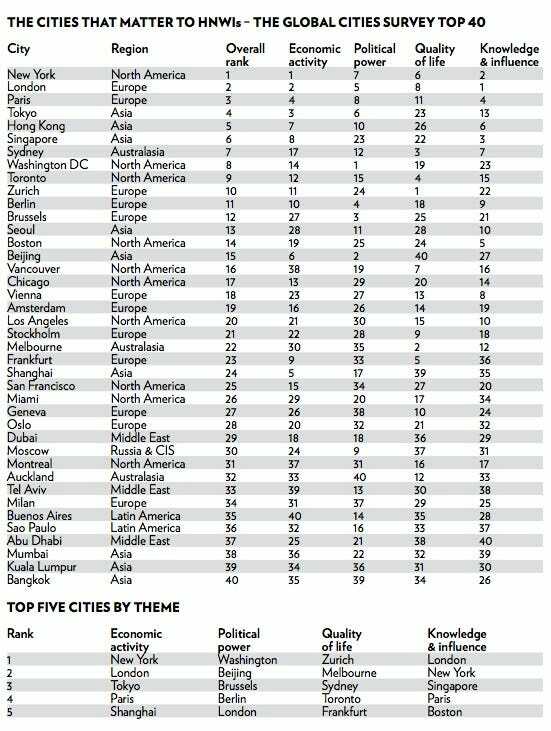 New York takes the top spot overall, while Zurich has the highest quality of life and Washington DC ranked highest in terms of political power.